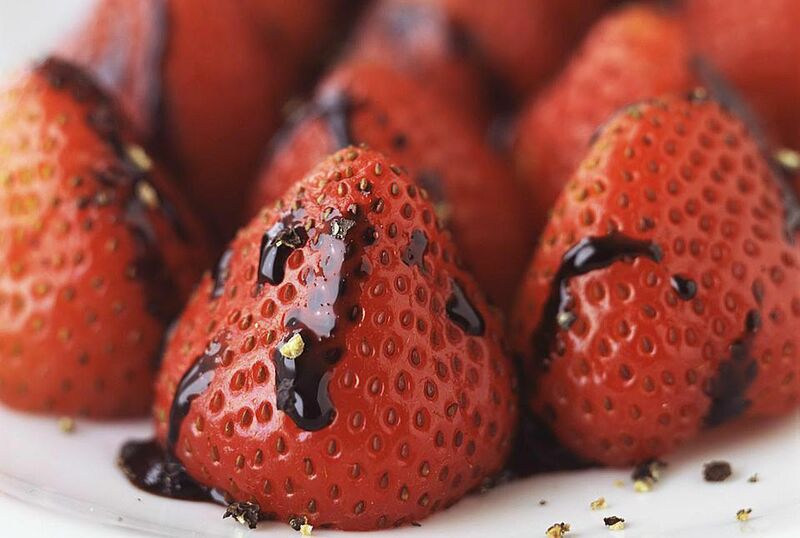 Balsamic vinegar and black pepper intensify the flavor of strawberries, bringing out their sweetness. The first time you hear about using the flavors together, you may be leery of giving it a try, but tasting is believing. If you're serving picky or non-adventurous eaters, you might want to keep this secret to yourself until after they've raved about how great the strawberries taste. These berries are great with both sweet and savory dishes. Try them atop field greens with goat cheese, or serve them for dessert over ice cream or pound cake. The better the quality of the balsamic vinegar and berries you use, the better this recipe will be. The only equipment you'll need is a knife for slicing the strawberries. Place the sliced berries in a medium non-reactive bowl (such as a glass bowl). Sprinkle the berries with the sugar and balsamic vinegar, and toss gently to coat. Allow the berries to macerate in the vinegar and sugar mixture for about 15 minutes. Add 4 to 5 grinds of coarse black pepper to the berries, and toss to coat. Allow the flavors to blend about 5 minutes more before serving. Chill leftovers in the refrigerator and use within a couple of days. You can also freeze any leftovers for longer periods. They will lose their shape but can be enjoyed mixed with ice cream or over other desserts. You can go wild with ways to serve these balsamic black pepper strawberries. They are great with summer salads, especially on field greens with some crumbled goat cheese or gorgonzola. You may not need any other salad dressing. Serve them as you would other sliced strawberries on desserts. They are delicious on an ice cream sundae. Make a quick dessert by spooning them over toasted pound cake. Take the usual strawberry shortcake up a notch by using balsamic black pepper strawberries. You can even enjoy them by themselves with a bit of whipped cream or lightly sweetened mascarpone. The highest quality balsamic vinegar is made in Italy from grape juice that is cooked to caramelize it and then it is aged and fermented in wooden barrels to give it complex flavors.